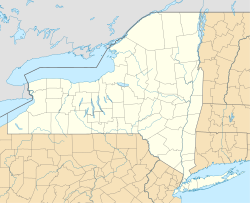 Cooperstown is a village in and county seat of Otsego County, New York, United States. Most of the village lies within the town of Otsego, but some of the eastern part is in the town of Middlefield. It is located in the Central New York Region of New York. Cooperstown is best known as the home of the National Baseball Hall of Fame and Museum. The Farmers' Museum, opened in 1944 on farm land that had once belonged to James Fenimore Cooper, the Fenimore Art Museum, Glimmerglass Opera, and the New York State Historical Association are also based here. 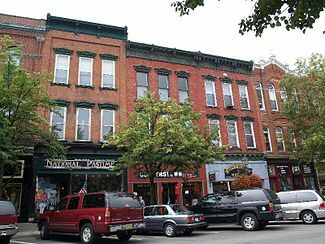 Most of the historic pre-1900 core of the village is included in the Cooperstown Historic District, which was listed on the National Register of Historic Places in 1980; its boundaries were increased in 1997 and more contributing properties were identified. Cooper established the village of Cooperstown in 1786, laid out by surveyor William Ellison. At the time, the area was part of Montgomery County. It was incorporated as the "Village of Otsego" on April 3, 1807. The name was changed to "Village of Cooperstown" June 12, 1812 after the founder. William Cooper was appointed as a county judge in the late 18th century, and was elected to the state assembly from Otsego County. The sister city of Cooperstown is Windsor, Nova Scotia. This is due to Windsor claiming to be the birthplace of Ice Hockey and Cooperstown at one time being considered to be the birthplace of Baseball. In the village the population was spread out with 20.2% under the age of 18, 5.4% from 18 to 24, 24.7% from 25 to 44, 22.8% from 45 to 64, and 26.9% who were 65 years of age or older. The median age was 45 years. For every 100 females, there were 81.4 males. For every 100 females age 18 and over, there were 76.8 males. The actress Michaela Dietz is a more recent notable Cooperstown resident. Aside from James Fenimore Cooper, noted Cooperstown authors include his daughter Susan Fenimore Cooper, the author of Rural Hours, and his great-great-grandson Paul Fenimore Cooper, author of Tal: His Marvelous Adventures with Noom-Zor-Noom (1929, 1957, 2001). Other writers include the prolific poet W. W. Lord, who captured Cooperstown in many of his poems, as well as modern author Lauren Groff, who has written extensively about her hometown, notably in The Monsters of Templeton, a story that brings several Cooperstown legends to life. The Clark family, whose fortune originated with a half-ownership of the patent for Singer Sewing Machine, have lived in Cooperstown since the mid-19th century. The family's holdings include interests assembled over a century and a half, which are now held through trusts and foundations. Their dominance is reflected in Clark ownership of more than 10,000 acres (40 km2) of largely undeveloped land in and around greater Cooperstown. In the village, the Otesaga, the Cooper Inn, Clark Estates, and the Clara Welch Thanksgiving Home are all Clark properties. In addition, the Clarks were founding partners of, and retain an interest in, the Baseball Hall of Fame and the Mary Imogene Bassett Hospital. Cooperstown still receives support from the Clark Foundation, which has donated to a variety of causes including various scholarships, non-profit organizations, and village services. The family has also donated land for the Cooperstown Central School District's new high school location − formerly horse stables − as well as for parks such as Fairy Springs and Council Rock, and recently, for a new Little League baseball field. Jane Forbes Clark II, the primary family heir today, has continued this commitment. She has purchased strategic land to ensure the preservation of village entry points, as well as overseeing the expansion of the various Clark holdings. In late November 2013, Clark discussed her family's continued support for the community during a meeting of The Women’s Club of Cooperstown. The Clark Foundation supports a variety of Cooperstown and Otsego County organizations and causes with donations of $7.5 million to charitable organizations every year. 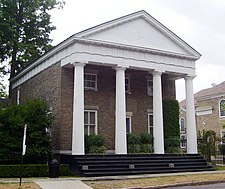 The family's Scriven Foundation, formed in 1975, donates only to Otsego County nonprofit organizations, such as the Cooperstown Village Library. The Scriven Foundation donates $1.5 million every year. According to Clark's presentation, the family's businesses employ 4,198 people, with 3,100 of those positions being full-time jobs. Through the 1970s, Main Street was still home to at least five grocery stores, including an A&P. Western Auto had a branch on Main Street and J.J. Newberry's had built, in 1960, a two-story five-and-dime with a fountain and lunch counter. Smalley's, a stage theater converted into a movie theater, had a single screen across from a Farm & Home store. With its post office, library, and the Baseball Hall of Fame, Main Street resembled a true village square. Today, the village has fewer traditional services for year-round and seasonal residents. Once boasting half a dozen gas stations, the village now has two. Traditional grocers have been reduced to one, and in 1977 Great American was built on the outskirts of town, replacing the town's bowling alley. In 2010 it was converted to a Price Chopper. Hardware stores such as Western Auto, McGown's and Farm & Home have been displaced by an Ace Hardware just outside the village. Newberry's morphed into a single-floor general store with the basement stairs boarded up, and even this general store finally closed entirely in 2017. Sherry's Famous Restaurant closed in the late 1990s after more than half a century of business. Most Main Street shops now cater to the tourist trade and feature gifts and souvenirs. Cooperstown was formerly served by the Cooperstown Municipal Airport, which was a two-runway facility fewer than two miles to the northwest of town center. That field closed in the 1960s. The village is now served by a small grass field in nearby Westville and a one-runway facility in Oneonta, NY. There are, and were, significant residential, commercial, and religious structures in Cooperstown. Original residences related to the founding Cooper family, such as Edgewater and Heathcote, are still standing. Otsego Hall, James Fenimore Cooper's residence which once stood in what is now Cooper Park, has been lost, along with his chalet. Byberry, the cottage built for his daughter, remains on River Street, albeit in altered form. Several prominent buildings in town were designed or updated by noted architect Frank P. Whiting, who originally worked under Ernest Flagg. A resident of New York City and Cooperstown, Whiting was also a noted artist. He designed the Farmers Museum farm buildings and the shingle-style manor at "Leatherstocking Falls Farm", the residence of Dorothy Stokes Bostwick Smith Campbell, the landscaping for which was done by the all-female firm of Wodell & Cottrell in the 1930s. Whiting also designed 56 Lake Street. In 1932 Whiting designed and built his residence, "Westerly", on a half acre lot at the north end of Nelson Avenue. The home is in the Colonial style and today retains many interior and exterior features of the original home. In June 1923 Whiting wrote a featured monograph "Cooperstown in The Times of Our Forefathers" for volume IX of the White Pine Series of Architectural Monographs containing several sketches and measured drawings of homes in Cooperstown. ^ History of Otsego County New York. Everts and Fariss. 1878. p. 260. ^ "Windsor, N.S. and Cooperstown, N.Y. are Twin Towns". City of Windsor, Nova Scotia. Archived from the original on 2007-08-29. Retrieved 2007-08-02. ^ "NowData - NOAA Online Weather Data". National Oceanic and Atmospheric Administration. Retrieved 2012-03-01. ^ "Cooperstown Central School District". ^ "COOPERSTOWN. ; Many Additions from New York to the Cottage Colony". The New York Times. June 16, 1912. Retrieved April 30, 2010. New York Times June 16, 1912 "Cooperstown; Many Additions from New York to the Cottage Colony"
Wikimedia Commons has media related to Cooperstown, New York. Wikivoyage has a travel guide for Cooperstown. Wikisource has the text of the 1911 Encyclopædia Britannica article Cooperstown.